The Boy Mark and I have the 45 minute rule for away games: if it takes longer than that to get to the ground we don't go. The Satnav proclaimed the time to be 47 minutes but since it was Consett with its artificial pitch promising ideal footie conditions and the added bonus of the spacious Consett clubhouse with its massive screens featuring the nation's football action, we made an exception. display the colour team sheet! Whilst enjoying the 0-0 feast between Arsenal and Hull City in the FA Cup, we were even given a COLOUR copy of the teamsheet....beat that Hillheads! We also met up with my Consettly-resident pals Amy and Leon. Leon's a local so knew the lingo while his wife Amy is a Whitley lass who moved to the hills and now commutes on a daily basis to work with me in North Shields. We often used to see them at Hillheads before they moved and the fact that they have now embraced the delights of Belle Vue Park shows how entertaining the football is. 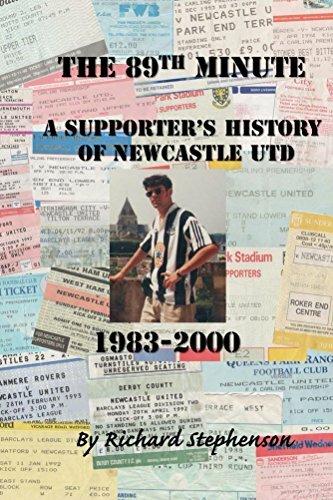 I also met Kevin, a Newcastle fan from Anfield Plain, whose brother I had written about in...THE 89th MINUTE - available from Amazon in paperback form and Kindle, would you believe? It turns out his brother and I had both lived in London at the same time and had chatted at Newcastle away games over 28 years ago...small world and a great memory on his behalf! He is enjoying my book btw but was saying how football had changed at the highest level. My answer now is always the same: the Northern League has more character in it than you could shake a stick at...and I've shaken a few sticks I can tell you! Not really the best thing for us hard lads to say at the match....? It was a nice touch - well done Consett! Also there was one for each sink...get them! One thing that was certain was that the wind was going to be a major factor in the game. "At least you've come on warm day!" started Leon as he struggled to stay upright as the wind threatened to bowl us over. "You need to be in the lead at half time otherwise you'll struggle in this wind." Unfortunately for us the lads didn't heed his advise when Consett scored a rubbish goal - all it was, was a hard shot struck on the half volley straight into the wind. How easy is that? However a few minutes later Shanks struck from a corner to level the scores as the wind carried the ball to him. Our first Whitley goal in four matches. Some of the local young lads had lost interest in the game and were belting a ball around behind the end defended by their team but one of their passes was wayward and their ball lay just by the corner flag...I had visions Graig McFarlane (that's what it said on the colour team-sheet) bombing down the wing only to either slip on their ball or cross the wrong ball. Something had to be done! An impromptu pitch invasion by the embarrassed culprit saved the day and everyone was able to relax. As we turned our attention to the pitch we immediately wished we hadn't as Consett's Sullivan's (Amy and Leon's favourite with his flowing locks) cross was driven into the far corner. It got worse as the home team surged into a 3-1 lead. Normal service had resumed and we weren't ahead with half time approaching. There was hope when the bun-headed Consett keeper flapped at a wind-diverted corner and there was Laws to pull the Bay back to within one goal. Just before half-time there was more off-pitch aggro in the stands as the ball was collected by a six-year-old girl. No sooner had she readied herself to throw the ball back than her nine-year-old brother had bowled her over, stolen the ball and claimed the credit. "That sort of thing should be stamped out of football..." we muttered as we returned our attention to the game, ignoring of the poor little thing crying on the floor. The Bay almost equalised but a simple-looking tap-in was missed at the far post. Half time meant a chance to visit the festival of food on sale at the kiosk...we didn't have any chips and gravy....no, no, no! If we had done so they probably would have instantly frozen as the wind whipped into the corner of the pitch we had made our own. As the second half began I struggled to attach the Bay Tricoleur in the tornado that was whipping around us. In the previous three games I had failed to re-attach it after our half-time move and we had lost. Therefore I thought it best to do my bit and was delighted to be rewarded by new boy Paul Kane running through on goal and slotting the ball perfectly past Bun-boy. That was as good as it got...In the 63rd minute, after a mix-up, Jennison performed a strange dive-over the ball and Consett were ahead. It looked like things were going to get worse when Consett were awarded a penalty, however Jennison made up for his funny antics a few minutes earlier with a fantastic save to his left from the resulting penalty. A Shanks cross almost produced an equaliser for the visitors but our luck had run out. As the final whistle beckoned, an extremely dodgy tackle upon Chris McD saw the youngster react and he was given a single red card.